HXR9 is a novel agent being explored for the treatment of patients with acute myeloid leukemia (AML). The drug is designed to prevent the shutdown of genes involved in apoptosis, which is the process that causes unhealthy and damaged cells to die, explained Richard Morgan, M.D. This novel drug specifically targets HOX genes, which are involved in controlling the rapid growth of cells. These genes are turned off in adults but can be switched on in cancer cells, allowing the cells to continuously grow and divide. In an analysis of 269 patients with AML, it was found that there was an association between the activity of HOX genes and the patient survival rate. These genes include HOXA5, HOXB2, HOXB4, HOXB9 and HOXC9. Genes HOXA4 and HOXA9 were found to show borderline significance. “If AML is expressing very high levels of HOX genes, then survival is extremely short relative to patients who have low amounts of HOX expression,” explains Morgan. 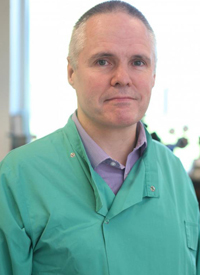 In an interview with CURE, Morgan, professor, director of the Institute for Cancer Therapeutics, University of Bradford, discussed this recent research involving therapy with HXR9 for patients with AML. Can you please provide an overview of the research? We’re interested in what’s called HOX genes. These have been looked at for a while, but were originally investigated in the context of the early development of the embryo. For example, they specify the identities of certain cells and tissues. Generally, it’s silenced in most adult cells but it became apparent over the last few decades that cancer cells, particularly AML, switch HOX genes back on as part of the oncogenic process. HOX genes in AML research have had quite a long history, partly as partners in chimeric fusion proteins that act as oncogenes and drive the process of leukemia formation. Also, because they’re overexpressed in leukemia, it’s never been clear what the function of HOX proteins are beyond their roles as these chimeric proteins. Our work has looked at ways of inhibiting the HOX function. One of the difficulties in doing this is that there are 39 different HOX proteins in the marrow. There is also quite a high level of function or redundancy. This is particularly in respect to functions such as promoting self-proliferation—so, for example, blocking apoptosis. An issue that exists is trying to block multiple HOX proteins at the same time. The solution we focused on was destructing the interaction between HOX proteins and one of their cofactors, which is called PBX. We designed this drug HXR9, which binds to the pocket in PBX, which otherwise HOX proteins would bind to. That prevents HOX-PBX from binding to enhancers and promoters in various target genes. We discovered that this prevents the shutdown of various genes involved in apoptosis. However, in the case of AML, it caused the cancer cells to undergo necroptosis [inflammatory cell death]. As you can see in the paper, we used HXR9 both on cell lines derived from AML and primary AML cells, meaning cells taken from the bone marrow of patients. This also includes a mouse model of AML, which is able to show that it provides effective control in triggering cell death. What are the next steps for this drug? There are many things that we’re trying to do. One of the things we identified in the paper was that it works for a very specific mechanism — the necroptosis — but there were many other drugs, such as protein kinase C inhibitors, which can strongly promote the possibility of the drug being used in combination. That was reflected in the results from the mouse model. In terms of taking this forward and out of a lab into clinical trials, that would certainly be a significant step forward as this paper gets completed and published. There is a company that holds patterns for these drugs—HXR9 and the derivative of HXR9, which have now gone through toxicity testing. They are hoping that phase 1 trials will begin early next year. That is the aim, although the possibility is that those trials will not initially be in AML. They may start in a solid malignancy but we are hoping that there will be subsequent trials later in 2018 to expand into other cancers, as well. Although this drug is still early in development, do you anticipate that it could work well in combination with other regimens? I think so. In the initial phase 1 studies, we will be focusing on safety and getting engagement. Our work and that of others points to possible combinations. For example, in some cancers, it seems to enhance radiosensitivity. One possibility would be to combine it with radiotherapy, but then there are other chemotherapeutic-type drugs that can possibly be combined with it. Also, DNA-damaging agents — such as cisplatin — seem to have signs of quite strong synergy. As I said, in this particular situation, AML drugs that inhibit protein kinase C activity might show quite a strong synergy, as well. What are the key points from this research? The first takeaway I hope people understand is that the HOX proteins are a novel target. That is one of the things that is exciting about this. It’s not a derivative of another drug or a drug that's aimed at the same target as most other drugs. This is genuinely a novel target in cancer. It does present a lot of opportunities for potentially treating cancer for patients who have failed first-line and second-line treatment. Additionally, there is very little treatment available for this patient population, which is one of the key aspects. There are cancers that have become resistant to other drugs; however, since this is a novel target, there is no particular reason why resistance would develop to HOX-PBX inhibitors. Another interesting point from this study is the close relationship between the level of HOX gene expression in cancer cells and patient survival. If AML is expressing very high levels of HOX genes, then survival is short relative to patients with low amounts of HOX expression. That is what is important from a prognostic point of view, but it is also important because it points to the possible significance of HOX as a target in these cancers.